A Bismarck Daily Tribune story from July 6, 1913. 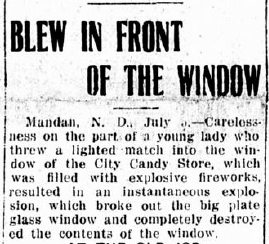 As we recover from the pyro-mania hangover associated with America’s Independence (no doubt, celebrated with hundreds of millions of dollars of Chinese fireworks), I came across this 100-year-old local story from The Bismarck Daily Tribune, front page, July 6, 1913. If you have ever witnessed the residential and professional fireworks displays on July 4th in Mandan, North Dakota, this little snippet may resonate with you. It feels somewhat like a war zone. Somewhat. Here is a bit of deep cultural backdrop on things that blow up, and have blown up, in Mandan, North Dakota around the first week of July. Enjoy. This entry was posted on Saturday, July 6th, 2013 at 9:53 am	and tagged with Mandan, North Dakota and posted in Uncategorized. You can follow any responses to this entry through the RSS 2.0 feed.